I have a bit of a never ending beauty wishlist that I'm constantly compiling in my head, so I thought it'd be a fun idea to put that wishlist into words and share it on my blog. Obviously it's going to take several (hundred) posts because I'm constantly finding new products to lust after, but these four are the ones that have really been on my mind this past week. The Body Shop Camomile Cleansing Balm - I already am head over heels in love with the Camomile Cleansing Oil from The Body Shop, and have heard equally great things about this Balm version. I am quite interested in trying this out because I have just been so impressed with the Cleansing Oil and at this point want to try everything from the line! Once I run out of the Cleansing Oil (which might be awhile, that bottle lasts for some time!) I'm thinking I'll pick this guy up and give it a try! 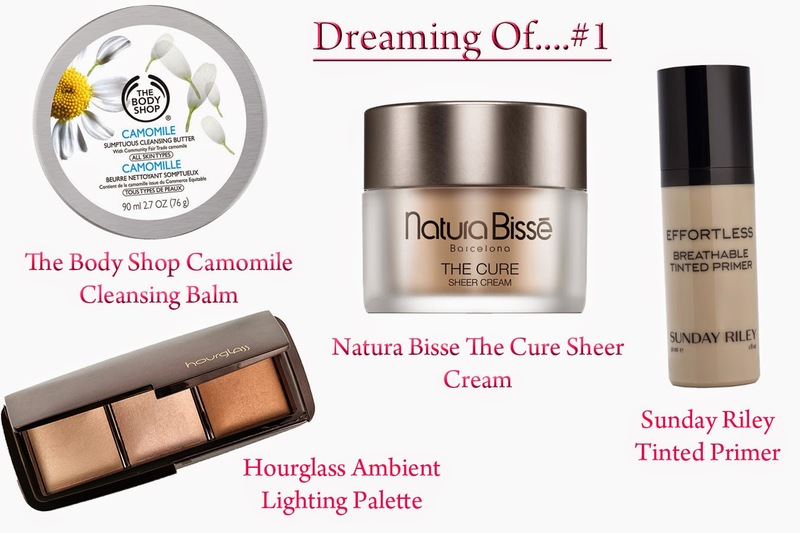 Natura Bisse The Cure Sheer Cream - This is the companion to my much-loved Natura Bisse The Cure Sheer Eye, and it is every bit as incredible. Somehow this moisturizer manages to self-adjust to the color of your skin, all while hydrating, illuminating and evening your skin tone. Not to mention it's full of skincare goodies that provide both short and long term benefits for your skin! I received a sample of this from my recent Space NK visit and have been wearing it every day since. It's an incredibly sheer amount of coverage, but adds just a hint of color while adjusting to your skin tone so it's nearly undetectable. It costs a pretty penny, but I am determined to add this to my collection because it just makes my skin so darn happy! Hourglass Ambient Lighting Palette - I'm ridiculously late to the game on this one, as I know it's been popular in the blogosphere for almost a year now. I recently tested this out during my Space NK birthday makeover and it was perfection! Seriously, I know I'm the last person to figure that out, but let me just add my name to the list of people that have fallen head over heels for this product. Somehow this powder manages to set to a nearly dewy finish, making your face look fresh and natural. Personally that is the look I prefer to wear, and it's nearly impossible to achieve through powders so I find this quite impressive! It contains a highlighter, a more bronze color and a setting powder that help create a flawless soft-focus look to your face. Sunday Riley Effortless Breathable Tinted Primer - Wow what a mouthful that name is! I've read some rave reviews of this on some of my favorite blogs, and it really seems like the type of hydrating, sheer base that's right up my alley! While I already have more bases then I really know what to do, I'm always looking for a new one to add to my collection. I think this could end up being perfect for my drier Fall/Winter skin, and would be awesome to use alone or as a primer with a foundation on top. Either way I'm sure this will be coming home with me sooner than later.